Magnificent update.Thank you for saving the day!!! Another great (Advance) addition to the family!!!! 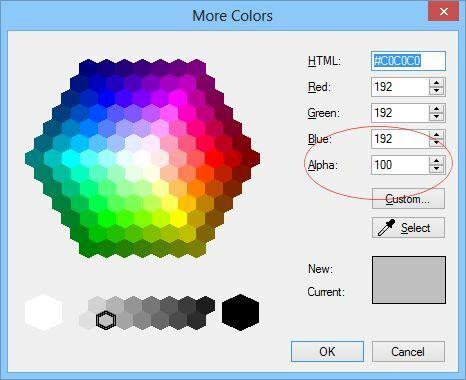 Select 'More colors' to set the exact values. Oh Yes! I had forgotten about that. Cheers Pablo. Apologies to Chapy & you Pablo for hijacking this thread, is there anyway to be able to enter the value in the colour slider as sometimes it is very hard to get the right value using a mouse. This has nothing to do with the extension. Google now requires you to obtain an API key which you can get from Google. Always a bit wary about the paid for ones... perfect example in this case - click the demo and see what you get Last thing you want to see on your site. A magnificent update. Thank you for taking up the suggestions. That's awesome! Well done to you and well done to Pablo for creating such a useful tool!!! !